Nassau County Executive Edward P. Mangano today announced a contract agreement with Veolia Transportation to manage and operate Long Island Bus under a new name – Nassau Inter-County Express (NICE) – starting January 1, 2012. The contract maintains current fares and the Able-Ride service area. The contract, which saves taxpayers over $32 million annually, was submitted this week to the Nassau County Legislature for review and approval. The County Legislature is expected to hold a public hearing on the contract prior to voting on the agreement. 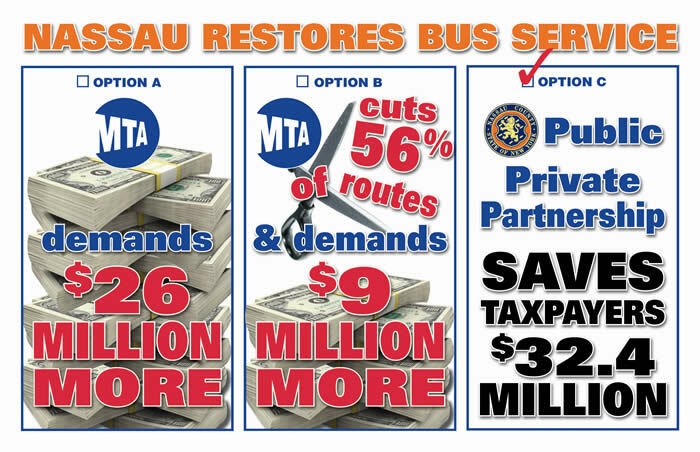 Saves taxpayers $32.4 million annually when compared to the MTA’s demand. The annual taxpayer direct subsidy will decrease from $9 million to $2.62 million, saving local taxpayers $6.38 million in addition to not having to pay the MTA $26 million a year. Maintains current fares. Fares cannot be raised unless approved by a 100% Nassau County Resident Transit Committee rather than the MTA Board with only one Nassau County representative. 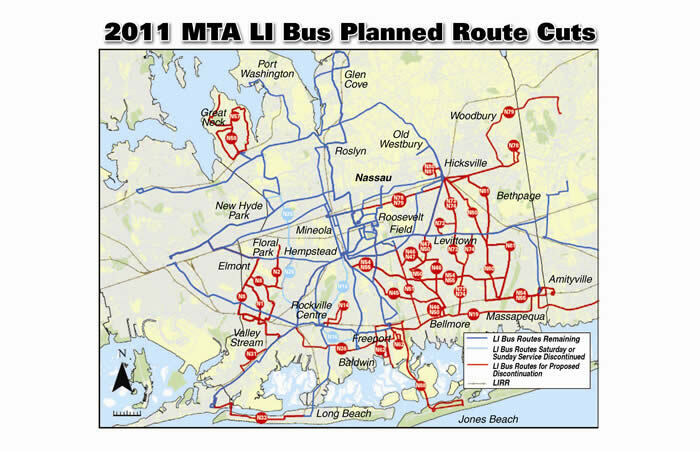 Preserves the Able-Ride service area for 2012 and 2013, rather than implement the MTA’s proposed cuts. Restores the MTA’s proposed route cuts. Increases transparency and oversight through the establishment of a Transit Committee, comprised of public transit professionals accountable to Nassau County, to provide quarterly and annual reviews of the private management and operation of the transit system. Insures customer satisfaction through an annual customer scorecard that measures time performance, service reliability, trips that are missed and bus cleanliness. Consolidates duplicative work and inefficiencies. “Through this public-private partnership, Nassau County will provide reliable bus service that taxpayers can afford,” added Mangano. 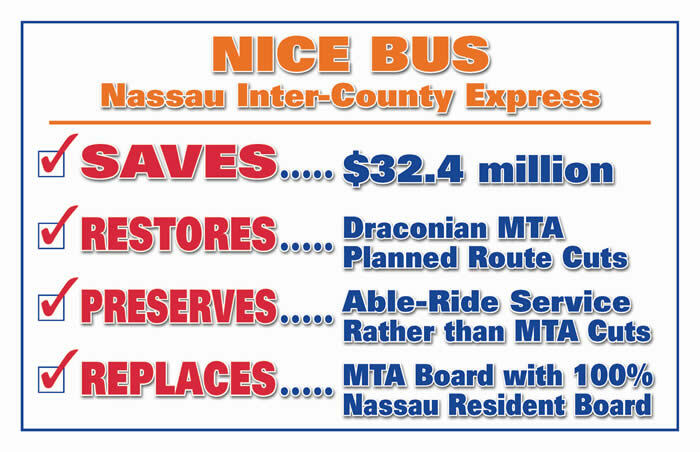 “The county’s bus system is a vital transportation link for thousands of riders who use it to commute to work, get to school, visit the doctor, shop or take other important daily trips.The mandate for our partnership with Nassau County is to meet the needs and the expectations of the riding public -- both current customers and future new customers – by maintaining an affordable, reliable, high-quality bus system,” said Mike Setzer, Veolia’s Chief Executive Officer for NICE.Setzer is a life-long transit professional who has been in charge of the bus systems in Cincinnati, St. Louis and Minneapolis-St. Paul.Veolia Transportation is a leader in managing transit systems for cities and counties in the U.S. and Canada.